Does anyone get that feeling when you’ve finish dinner and just NEED something sweet? Some people tell me to reach for a square of dark chocolate and be done with it, but let’s be honest, that just won’t cut it for “dessert”. Last week, I wanted something extra chocolatey and super indulgent, and I was not willing to be patient while staring at my cake as it bakes in the oven, teasing me with every tick of the clock. It would also have to be gluten-free and dairy-free, ideally made from pure wholesome ingredients that wouldn’t give me an energy crash straight after… surely that couldn’t be too much to ask for?! The result: the most divine, single-serve mug cake, blissfully fluffy on the outside, but with a moist and gooey centre that literally melts on your tongue. It takes a couple of minutes to whip up from start to finish – if using a microwave – or 10 minutes with the oven version (which I personally prefer – worth the 8 extra minutes in my opinion!). Not only is it gluten-free, but also completely grain-free (suitable for those following the Paleo diet) and comes complete with a vegan option if you sub the egg! 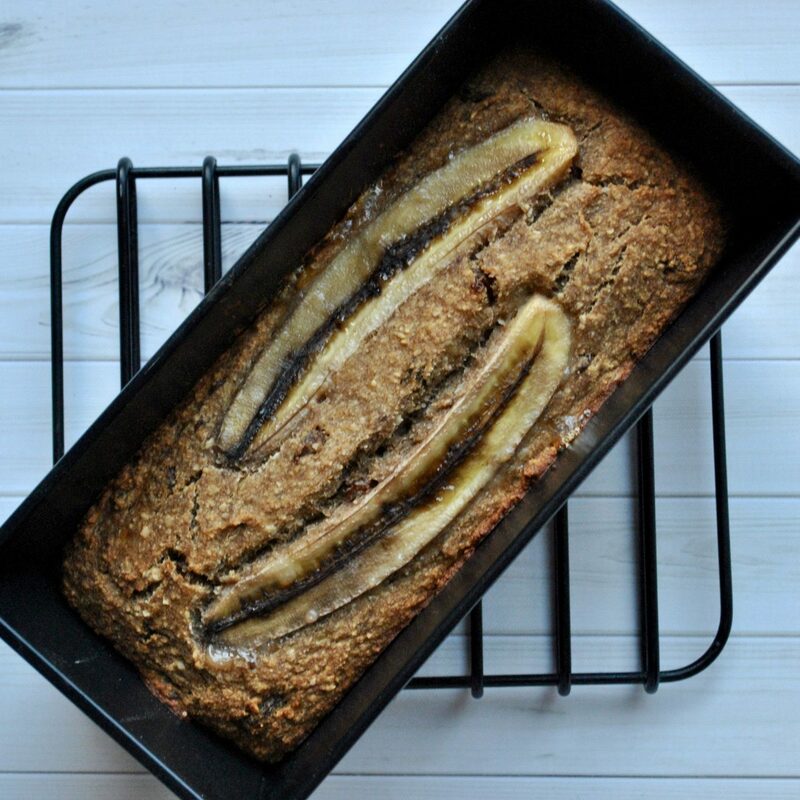 It is high in fibre as well as healthy fats from the coconut flour and nut butter, and packs a nutritional punch from the cacao. 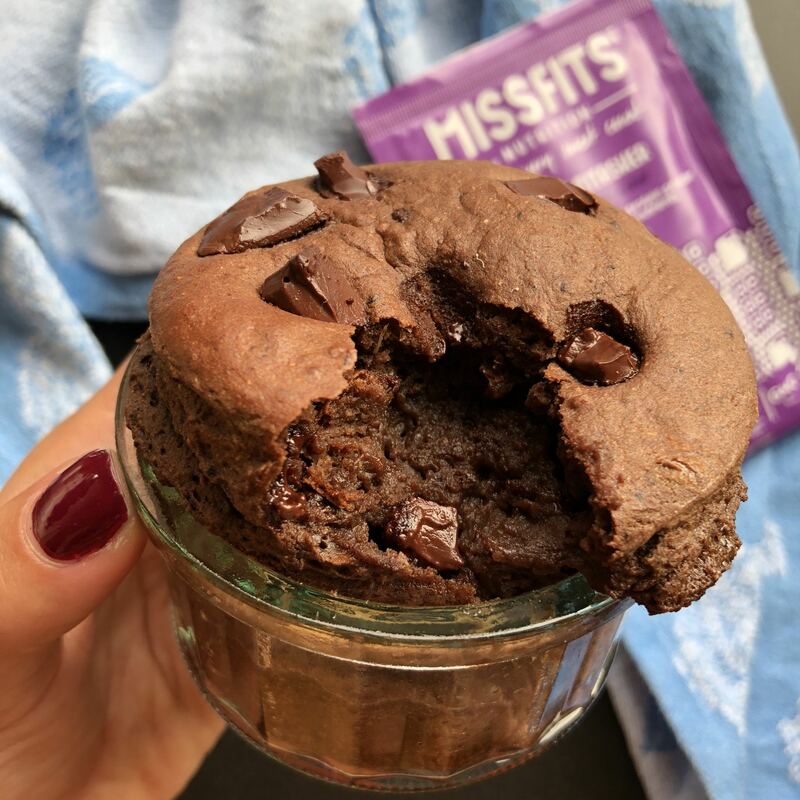 It is also packed with protein thanks to a scoop of my all-time favourite chocolate protein powder MissFits Nutrition ( you can get £5 off with my code Eli5 ). 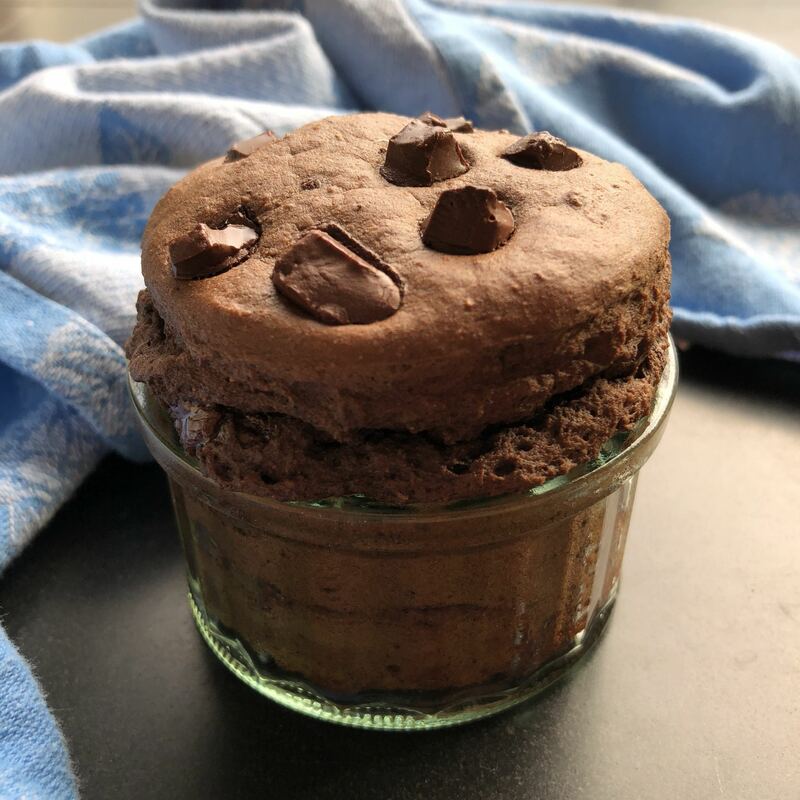 This is definitely one of my favourite chocolate recipes, alongside my Chocolate Peanut Butter Cup Milkshake, Raw Protein Brownies with Salted Caramel Frosting, and my Brain-Boosting Hot Chocolate. If you make it, don’t forget to tag me on Instagram @cerealandpeanutbutter as I LOVE seeing your creations! Mix all dry ingredients in a bowl: protein powder, cacao powder, baking powder, coconut flour, coconut sugar and chocolate chunks. In a separate bowl, whisk egg, milk, cashew butter and vanilla, and stir it into the dry mixture until fully combined. For microwave version: Grease a mug with coconut oil, pour mixture in top with more chocolate chips and heat in the microwave for 60-90 seconds. 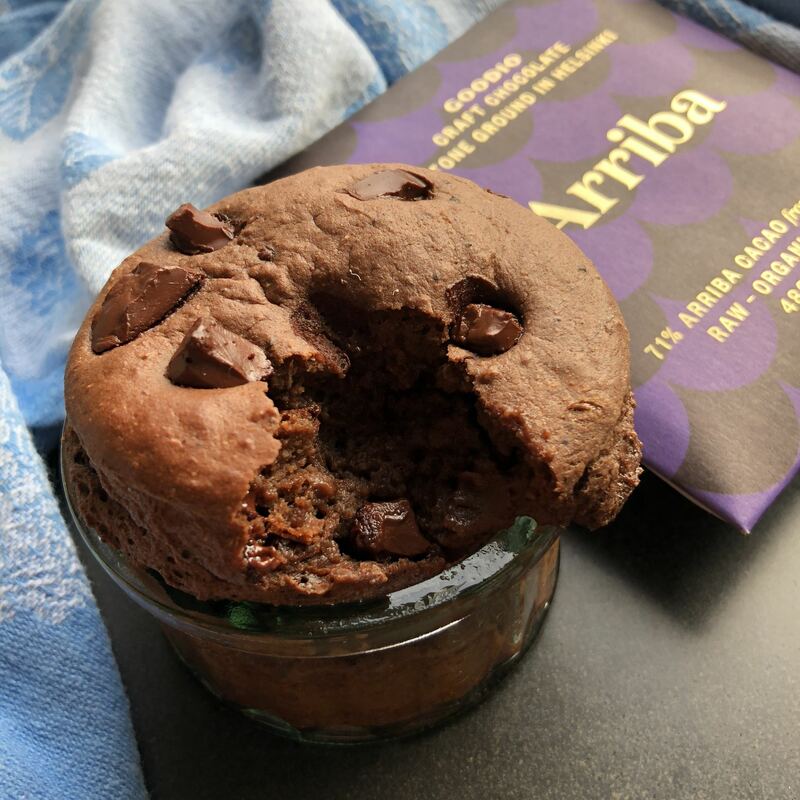 For oven version: Pour batter into a greased oven-proof ramekin, top with more chocolate chips and bake for 10 minutes on 180 C, or for an extra couple of minutes if you want a drier muffin texture.